Mentorgraph Modelsim is an simulation tool and is being used in many industries for simulation and code verification. This tool can be used for simulation along with Xilinx (upto ISE 9.x). But recent Xilinx edition have withdrawn other third-party simulation & addon support. But this is an easy tool when you need to just simulate and verify the code & its correctness. But the steps are likely to be confusing. Here we present an example for creating a new design file and simulating it in Modelsim version SE6. 2. Then, goto FILE->CHANGE DIRECTORY to change the current working directory. 3. Choose your required folder. Here I choose "C:\My Projects". 4. Now create a new work library by, FILE-> NEW-> LIBRARY. 5. 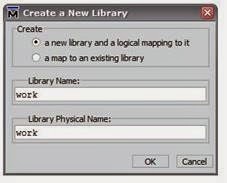 In create, select 'a new lib & logical map to it' and give Library Name and Library Physical Name as "work". 7. Type the verilog code and save it. 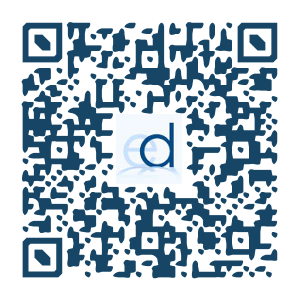 Here a positive edge triggered D flip flop synchronous reset and preset is used. 8. Now compile the code by, COMPILE->COMPILE. In the pop-up window select your code file and compile it. If done successfully, we can see the report in transcript window. And the module will be added under the work directory. 9. To simulate the module double click the module name under the Library window. This will start simulating with full optimization. Check the report in transcript window. 10. If you can't see a wave window, choose VIEW->WAVE. This opens the wave window. It will be empty without any signals. 11. To add the signals to it, under Objects window, right click on required signals and select ADD->TO WAVE-> SELECTED SIGNALS. Then those will be added to the wave window. This can also be performed by typing "add wave *" in the transcript window. Just copy and paste these lines in the transcript window & hit enter. The waveforms appear in the Wave window. The transcript shown here includes all the possible input combinations of the DFF. Note that the RSTB is the high priority signal, then PREB and finally the DATA. Here a 5ns offset to clock is added. It is similar to setup time. 14. A testbench file can also be used to simulate a code. 15. For that, both main module and the test bench module has to be compiled. Then simulate the TEST BENCH file and just run for required time. Click here to goto Verilog Tutorials.